Here’s how long you can expect those boughs to stay beautiful. Q: Our family wants to replace our artificial Christmas tree with a real one this year, and the kids want to go tree shopping now. I worry that the tree will dry out before Christmas if we buy too early. How long does a Christmas tree last? A: A real evergreen will no doubt make a festive and fragrant addition to your home, but most trees last weeks, not months. The moist stem and branches will dry and needles will transition from vibrant dark green to brown, then begin to fall. Fortunately, if you take a fastidious approach to tree selection, preparation, and care, you can keep it looking lovely longer—perhaps even into the new year. A freshly cut Christmas tree lasts up to four weeks on average if you treat it right. Place the tree upright in a metal, plastic, or concrete reservoir-style tree stand ($15 to $25 at home centers). Fill the stand with one quart of cool tap water for each inch of stem (e.g., use a gallon of water for a tree with a four-inch stem) within two hours of getting it home. Monitor the water level in daily and add more as needed to keep the bottom two inches of trunk submerged. Watering requirements are usually the highest during the first week the tree is up and decline in subsequent weeks. … ask upfront about the tree cutting date. Christmas trees are cut from mid-November to mid-December, so don’t assume that all trees you find for sale were freshly cut. If buying a pre-cut tree, ask when the trees on the lot were cut. Choose one that came down recently (within the week, if possible) so that it preserves its looks through the season. … pick fir or cypress over spruce or pine. 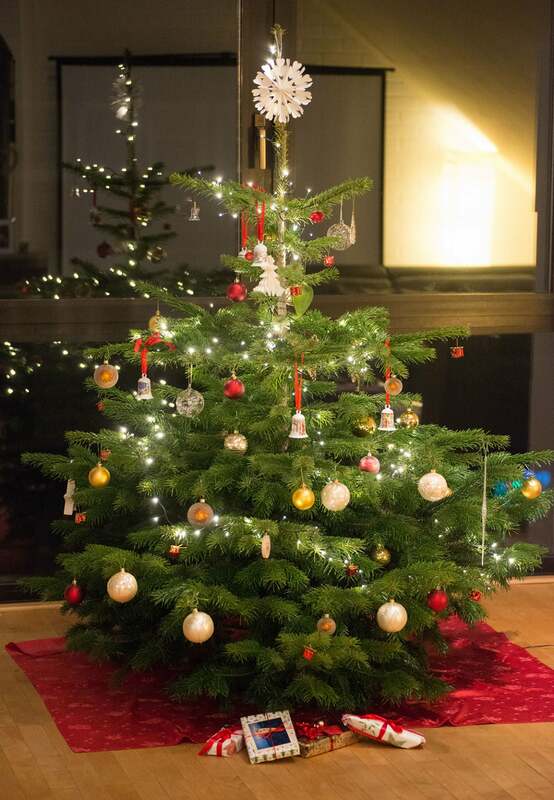 How long a Christmas tree last will vary depending on the specific evergreen conifer species. 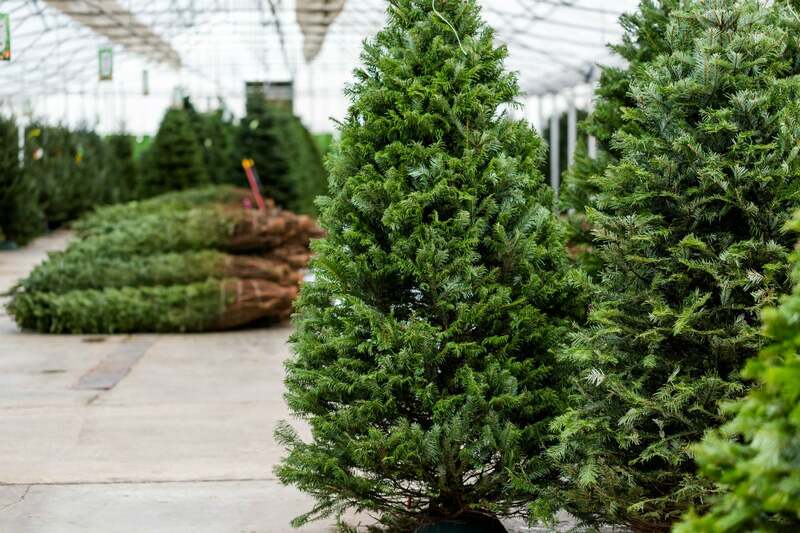 Most often, Christmas trees available at tree farms or local home and garden centers belong to fir, cypress, pine, and spruce. Fir and cypress tend to keep most of their needles for four or five weeks, respectively, whereas pine and spruce are more likely to lose a high volume of needles within two or three weeks, respectively. Before buying the tree you have your eye on, take it by the trunk and give it a shake to observe the volume and color of the needles that fall off. Only a few brown needles should come off if the tree is fresh; numerous fallen green needles are a telltale sign that the tree has already gone dry. … have it baled before bringing it home. Many unsuspecting folks transport unbundled Christmas trees inside a truck cargo bed only to arrive home and find numerous branches bent and needles fallen on the way. If you’ll be hauling your tree home yourself rather than have it delivered, ask to have it put through a baling machine that will wrap it in protective netting or twine while also condensing its size without damaging the stem or branches. 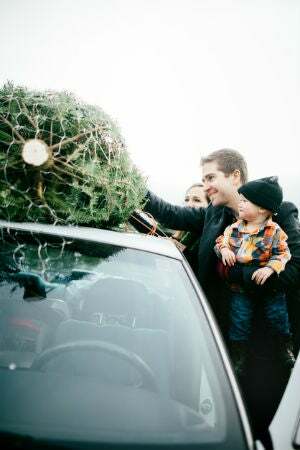 If driving home in a car as opposed to a truck, securely tie the baled tree to the roof racks with rope. Remove the netting once you have placed the tree inside your tree stand. … unseal the tree trunk before putting it in water. If your tree was cut more than six to eight hours ago (ask the attendant at the point of purchased exactly when it was cut), a layer of resin will have formed over the cells of the wood at the base of the trunk, sealing it and preventing water uptake. To re-open the cells so that the tree can absorb water, use a saw to cut a half inch of wood off of the base of the tree trunk before you place it in your tree stand. Over the years, homeowners have laced the water in their tree stands with everything from floral preservatives to powdered bleach and crushed aspirin to keep their trees fresh. But there is no evidence that such additives prolong tree life; in fact, they can actually inhibit water retention and cause the tree to dry out faster. Only plain tap water is needed to quench your tree’s thirst. … keep the tree out of the heat. To preserve moist needles and that vivid green hue, position your tree indoors at a temperature of ideally no more than 70 degrees Fahrenheit and away from direct sunlight. Similarly, avoid placing the tree near a fireplace, radiator, or space heater, as the heat from these sources can prematurely dry and brown your tree. … invest in a moisture monitor. Forgetting to regularly monitor and refill water in the tree stand or misjudging the current water level and not adding enough can result in premature drying. A moisture level monitor (e.g., Evergreen Elf, $22.99 on Amazon) mounted to the base of the tree stand can automatically sense the water level in the stand and light up or beep when the level is low to signal that it’s time to re-water. … use miniature LED tree lights. LED Christmas lights, particularly those in a miniature size (5 mm in length), use less energy and generate less heat than larger, incandescent bulbs. Adorning your tree with these energy-efficient lights will reduce drying and keep it fresh and green longer.